Technical Bulletin #4 - The Most Common Reasons for Loss of Color - National Plasterers Council National Plasterers Council. Pigments have been used in swimming pool cementitious finish coatings for many years. The diversity of available colors, together with a variety of finish options, allows for almost limitless possibilities of aesthetic variation to be achieved. However, maintaining the intended “look” of the finish, in terms of color and intensity, can be difficult. Proper materials1 and application ensure that a pool interior finish will achieve the anticipated service life, provided the proper start-up14, proper ongoing care, and proper water chemistry is maintained within the “acceptable” range as per APSP.2,3,12 The following conditions are the three most common causes of color loss issues whenever post-installation measures are not adequately performed or maintained. Cement ‘hydration’ is basically the chemical reaction that converts dry cement powdered materials and water into a rigid structural material, or binder. 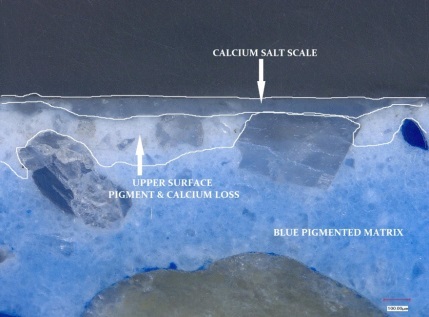 While approximately 70% of cement hydration takes place in the first 7-days from the time of mixing, there is still a significant amount of hydration that will take place over the next 28 days (to approximately 85% of cement hydration).16 The remaining unhydrated cement will continue to hydrate for years after placement.13 However, the pigment that is dispersed throughout the cementitious material during the initial mixing of the material becomes locked into place once the cement reaches final set. Though the pigment is no longer free to move or disperse after final set, cement hydration continues. 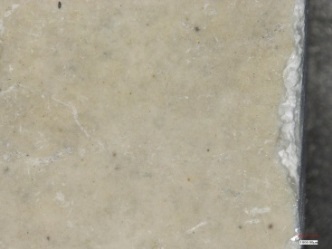 A byproduct of the cement hydration reaction is a salt (calcium hydroxide), which ionizes in the presence of moisture and is free to migrate throughout the interior of the finish coating.7,8,9 These calcium hydroxide ions can settle out, or precipitate to form a white crystalline deposit that can cover, or mask, the coloration of the finish. For swimming pools, the greatest potential for pigment masking is on newly installed finishes within the first 3-days after the pool is filled with water. Adhering to a proper start-up procedure is important. Removal of any calcium hydroxide that migrates to the surface (plaster dust) is also important. Calcium hydroxide (plaster dust) should be removed and filtered out of the water within the first 3 – 5 days after the pool is full or it will carbonate and adhere to the surface. Calcium carbonate can be difficult and expensive to remove. 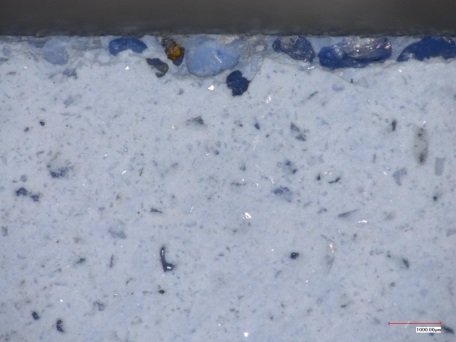 All materials that are in a water-contact environment are subject to mineral scale or metal stain precipitation. Concrete, cementitious coatings, brick, metal, tile, and even glass surfaces are subject to salt scale or staining from minerals or metals precipitating from the water. Surface scaling often exhibits itself as a white or light-colored film or layer, which can mute or completely mask the intended finish color. Metal precipitation can often alter the coloration of the surface by staining the finish. For example, copper and manganese can cause a blue, green, or black coloration and iron can cause a red, orange, or black coloration. Having the water periodically tested for metals and hardness, and taking the necessary precautions to avoid the accumulation of significant concentrations of metals and mineral salts can avoid this from occurring. Alternatively, sequestering or chelating chemicals may be used. However; once started, their continued usage becomes necessary as long as significant amounts of mineral or metal remain in the water, or precipitation of that mineral or metal is likely. Water chemistry plays an important role in the life expectancy of a cementitious coating. Reactions with the soluble cementitious materials can take place whenever water, or moisture, is allowed to permeate through a cementitious surface coating. Water chemistry parameters that are not maintained within the “ideal ranges”, as defined by ANSI/APSP to be “balanced”2,3 can become aggressive to the cementitious surface coating. Allowing such conditions, can result in the dissolving of components of the cement/aggregate matrix and the leaching of cement compounds.5,6,10,11 The leaching of the pigment, which is held in place by these cement compounds, occurs as well.15 Organic pigments have a much smaller particle sizing than inorganic pigments, making them more likely to be released from the cement binder and lost, as the binder becomes more porous from ongoing deterioration or weathering. Generally, this appears as ‘faded’, lighter-colored, or white areas across the surface. 3. ANSI/APSP – 5, “American National Standard for Residential Inground Swimming Pools”, Appendix A, Sections A-1 to A-3, 2011. 4. National Plasterers Council, “Technical Manual”, 8th Edition, 2016, Section 7.6.1.5 – Aggressive Water Deterioration, p. 25, 1000 N Rand Road, Suite 214, Wauconda, IL 60084, info@npconline.org. 5. National Plasterers Council, “Technical Manual”, 8th Edition, 2016, Section 7.6.1.6 – Leaching Deterioration, pp. 25 – 26, 1000 N Rand Road, Suite 214, Wauconda, IL 60084, info@npconline.org. 6. National Plasterers Council, “Technical Manual”, 8th Edition, 2016, Section 7.6.1.1 – Aggressive Chemical Attack, p. 27, 1000 N Rand Road, Suite 214, Wauconda, IL 60084, info@npconline.org. 7. S. A. Rodgers, G.W. 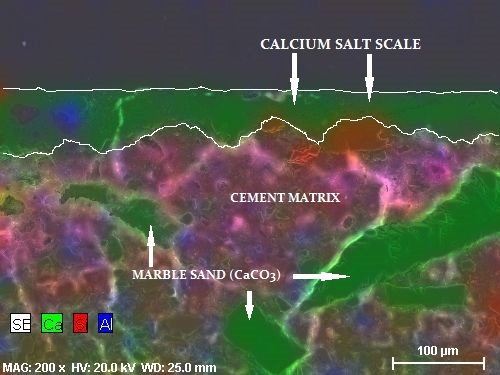 Groves, N.J. Clayden, and C. M. Dobson, “A Study of Tricalcium Silicate Hydration from Very Early to Very Late Stages”, Symposium Proceedings, Microstructural Development Driving Hydration, of Cements, Materials Research Society, Vol. 85, pp. 21 - 31. 8. 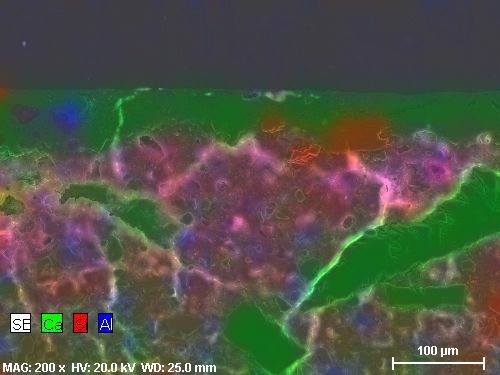 Sidney Diamond, “Cement Paste Microstructure in Concrete, Symposium Proceedings, Microstructural Development Driving Hydration of Cements”, Materials Research Society, Vol. 85, pp. 21 - 31. 9. Sidney Diamond, “Methodologies of PSD (pore size diameter) Measurements in HCP (hydrated cement paste): Postulates, Peculiarities, and Problems”, Materials Research Society, Symposium Proceedings, November 28-30, 1988, Pore Structure and Durability of Cementitious Materials, Volume 137, October 1989, pp 83 - 89. 10. ACI 201.2R-08, Guide to Durable Concrete, Section 6.5.2 Acid Attack Mechanisms, Section 6.5.3-Carbonation by Contact with Water, American Concrete Institute, 38800 Country Club Dr., Farmington Hills, Michigan, 48331, www.concrete.org , p. 27. 11. A. Delagrave, B. Gerard, and J. Marchand, “Modelling the Calcium Leaching Mechanisms in Hydrated Cement Pastes”, Materials Research Society, Symposium Proceedings, November 27-30, 1995, Mechanisms of Chemical Deterioration of Cement-Based Systems, Volume 144, October 1997, pp. 38 - 49. 12. The Association of Pool and Spa Professionals University, APSP Service Tech Manual, 4th Edition, V. 4.3, Unit 3: Water Quality, Alexandria, Virginia, 2013. 13. Yue Li, Wei Guo, and Hong Li, “Method to Calculate Cement Content in Hardened Concrete Based on Theory of Carbonation”, ACI Materials Journal, April 2017, pp. 245 - 251. 14. National Plasterers Council, “Swimming Pool Start-up Procedures”, 1000 N Rand Road, Suite 214, Wauconda, IL 60084, info@npconline.org. 15. National Plasterers Council, Technical Bulletin #3 – “Swimming Pool Interior Finishes & Chemical Etching Deterioration”, 1000 N Rand Road, Suite 214, Wauconda, IL 60084, info@npconline.org. 16. J. Thomas, H. Jennings, The Science of Concrete, Section 5.1, Overview of the Hydration Process, Fig. 5-3, “Typical Development of the Degree of Hydration and Compressive Strength of a Type I Portland Cement Over Time”, Northwestern University, Evanston, IL.